First-rounders from the last three years are the highlights in Milwaukee's thin group of youngsters. Catcher Mario Feliciano, a competitive balance selection out of Puerto Rico at 75th overall in 2016, reached Class A Advanced last year at just 19 years old. Injuries limited him to just 42 games, however, and a planned Arizona Fall League trip never happened due to shoulder discomfort that led to arthroscopic surgery in November. Outfielder Tristen Lutz and shortstop Brice Turang were brighter spots. 2017 34th-overall pick Lutz was solid, posting a .742 OPS over 119 games after starting slowly in the Midwest League. Turang, taken at No. 21 last June, played in 42 contests between the Rookie-level AZL and Pioneer League and registered a .283/.396/.352 line with 37 runs scored and 14 stolen bases. But the Brewers' strength in the system is in its older prospects like Keston Hiura, Corey Ray and Zack Brown, and when that crew graduates, the farm as a whole will take a hit. The big bat of Triston Casas, featuring a 60-grade power, immediately vaulted him to the No. 2 prospect in the system, but Casas didn't get to show much in his pro debut. The corner infielder tore a ligament in his right thumb while diving for a ball at third base in just his second game in the GCL and missed the rest of the season. Injuries proved to be a theme for Boston's youngest talent. After signing with the Red Sox in 2017, shortstop Antoni Flores likewise had his year cut short by injury. Totaling just 15 games in the Rookie-level Dominican Summer and Gulf Coast Leagues, Flores missed six weeks after suffering a left shoulder strain on a swing. Left-hander Jay Groome had Tommy John surgery last May and didn't pitch at all. All three have decent ceilings, keeping Boston out of the basement here. However, the Sox rank low in young talent at a time when the Major League roster is loaded. After a fantastic debut season in which he hit .348/.404/.645 in 35 Rookie-level AZL games, outfielder Heliot Ramos slowed down in 2018. Just 18 all last season, Ramos batted .245/.313/.396 in 124 games for Class A Augusta but did earn an invitation to the Futures Game. Shortstop Marco Luciano was San Francisco's biggest international signing since Lucius Fox in 2015 but won't make his debut until this season. Towering right-hander Sean Hjelle went to the Giants in the second round of last year's Draft out of Kentucky but scuffled at the end of a long year, putting up a 5.06 ERA in 12 starts, though his 22 strikeouts and four walks in 24 innings were encouraging. Fellow righty Gregory Santos went 2-5 with a 4.53 ERA in 12 outings alongside Hjelle for Salem-Keizer. While still limited to signing bonuses of $300,000 or less in 2017, the Giants signed third baseman Luis Toribio, who put up a .902 OPS in 64 DSL games. Chicago might not have a wealth of 21-and-under talent, but six of the Cubs' top seven prospects all fit the classification. Catcher Miguel Amaya has received stellar reviews for his defense and makeup, and handled Class A pitching at just 19 years old last year, batting .256/.349/.403 with 12 homers and 52 RBIs in 116 games. The Cubs nabbed Nico Hoerner out of Stanford with the 24th overall pick last year and watched the shortstop, who won't turn 22 until May, excel in the Arizona Fall League with a .337/.362/.506 line after playing just 14 regular season games. Left-handed pitcher Brailyn Marquez signed back in 2015 but is still just 20 years old. He reached Class A South Bend last year for a brief cameo and boasts above-average grades for both his fastball and curveball. Outfielders Cole Roederer and Brennen Davis both saw action in the AZL after being drafted last year while shortstop Aramis Ademan played 114 games for Class A Advanced Myrtle Beach at 19. The Phils would have been higher on this list, but shipping former top prospect Sixto Sanchez to the Marlins in the J.T. Realmuto deal left the system lighter. Shortstop Luis Garcia leads the way instead after a terrific professional bow. The 18-year-old won the Gulf Coast League batting title last year with a .369 average to go along with his .433 on-base percentage and .488 slugging percentage. His opening assignment this year should be interesting. One step up the ladder, right-handed pitcher Francisco Morales has a lot of impressive tools but is still working on putting them all together. Morales tallied 68 strikeouts in 57 1/3 innings for Class A Short Season Williamsport but walked 33 and registered a 5.27 ERA. Though the shine has worn off 2016 first-overall pick Mickey Moniak some, the outfielder produced a .286/.332/.442 line in the second half of the 2018 season with Class A Advanced Clearwater, showing clear improvement. Like the Cubs, much of the Rockies' youngest talent is in its highest rankings including seven of Colorado's top nine. If perennial All-Star third baseman Nolan Arenado doesn't choose to stay in Denver long-term, Colton Welker is climbing the ladder. The 21-year-old won the California League batting title in 2018 with a .333/.383/.489 line, 13 home runs and 82 RBIs. His corner infield counterpart in Lancaster, Tyler Nevin, was right on his heels, hitting .328/.386/.503 with 13 homers and 62 driven in. Right-handed pitcher Peter Lambert should climb to Coors Field sometime this year if he can handle Triple-A. After going 8-2 with a 2.23 ERA for Double-A Hartford to start 2018, Lambert put up a 2-5 record and 5.04 ERA in 11 starts following a promotion to Albuquerque. Hulking first base prospect Grant Lavigne batted .350/.477/.519 for Rookie-level Grand Junction in the hitter-friendly Pioneer League and should start 2019 with Class A Asheville. Welker is the only Top-100 prospect here at No. 95. The O's freshest young prospects are mostly pitchers. Left-hander DL Hall struck out 100 batters in 94 1/3 innings, put up a 2.10 ERA and 1.17 WHIP and limited hitters to a .203 average at Class A Delmarva last season. Last year's first-round pick, right-hander Grayson Rodriguez, registered a 1.40 ERA and 20 strikeouts in 19 1/3 innings over nine appearances for the GCL Orioles. Righty Brenan Hanifee finished among the South Atlantic League leaders with a 2.86 ERA and 132 innings pitched over 23 starts last summer. On the left side of the infield, Baltimore liked third baseman Jean Carlos Encarnacion so much that they acquired him from Atlanta at the trade deadline last year. Canadian shortstop Adam Hall struggled at the outset last year but put up an average near .360 and OPS over .900 in his final 36 games. Estevan Florial leads the way with three above-average tools but faces concerns about his contact rate. Being a full year removed from hamate surgery should help as he returns to Class A Advanced Tampa or rises to Double-A Trenton. Right-handed pitcher Deivi Garcia got better as he climbed last year, putting up a 3.76 ERA in eight starts with Class A Charleston and then a 1.27 mark in five outings for Tampa. The Yanks nabbed switch-hitting catcher Anthony Seigler in the first round last year and saw him more than hold his own with a .721 OPS in 24 games between the GCL and Appalachian League. Also in Pulaski was outfielder Everson Pereira, whose 55-grade arm and 60-grade fielding tools might be most impressive but who also put up a .263/.322/.389 line at age 17. The Yanks get younger the further down their prospect list you go -- a promising sign, but one that raises the possibility of wide variance in outcomes. Khalil Lee ascended to Double-A last year just after his 20th birthday and, in 100 games between Class A Advanced Wilmington and Northwest Arkansas, hit .263/.382/.390. The outfielder also played in the Arizona Fall League and could make a Kansas City cameo this season. Catcher MJ Melendez has the potential to be an all-around star catcher and showcased that last season with Class A Lexington, swatting 19 homers and driving in 73 runs while demonstrating the defensive prowess that's earned him 60-grade arm and fielding tools. Royals' 2017 first-rounder Nick Pratto started a steady climb by posting a .280/.343/.443 line with 14 homers and 62 RBIs at Lexington in his first full pro season. While Melendez and Pratto impressed, outfielder Seuly Matias might have been the biggest highlight at Class A last year, belting 31 homers in 94 games before suffering a thumb injury. Melendez mentioned to MiLB.com last week that Kansas City hopes this young core can echo the successes of the one that brought World Series glory to the organization earlier this decade. With no Top-100 prospects in the group right now, they still have a long road ahead. Plucked out of South Alabama last year with the 10th overall pick, outfielder Travis Swaggerty, who will be 21 for most of the 2019 season, made it to full-season ball in his first pro summer. At West Virginia, he joined shortstop Oneil Cruz, who hit .286/.343/.488 with 14 homers and 59 RBIs in 103 Class A games at 19 years old. At 6-foot-6, Cruz is towering for a shortstop but possesses a strong defensive presence and cannon arm. Outfielder Calvin Mitchell was named a South Atlantic League All-Star and hit with pop, racking up 29 doubles and 10 home runs. The Bucs signed right-hander Steven Jennings away from a commitment to Ole Miss in 2017. He made 13 starts for Rookie-level Bristol last year. No Mitch Keller, Ke'Bryan Hayes or Cole Tucker here, but it's a good mix of prospects. The White Sox have plenty to like about their rebuild, though most of their blue-chip prospects sit above the 21-year-old mark. That's not to say they don't have any strong players in the 21-U category, however. Luis Robert, who begins 2019 as MLB.com's No. 40 overall prospect, has proven to be a polarizing prospect with some injury and strikeout concerns. The outfielder hit .269/.333/.360 in 50 games last season and flashed some strong defense and speed in center field. Blake Rutherford will head to Double-A to continue to build off the strong year he had in 2018, while 2018 third-rounder Konnor Pilkington can put together a strong first full season on the bump. The White Sox have plenty to love about the top of their system, but most of the talent there (e.g. Eloy Jimenez, Dylan Cease, Michael Kopech, Nick Madrigal) doesn't fit this category. So if there's a strength here, it's in experience. In dealing Paul Goldschmidt to the Cardinals, the D-backs signaled they're looking to rely on some of their youth within the system to compete for the foreseeable future. To that end, there's Jazz Chisholm leading the way after flashing his hit and power tools last season. He blasted 25 homers and finished with an .842 OPS between Class A and A Advanced and continued to hit well in the Arizona Fall League. And with a quick glove and quality arm, Chisholm can handle both sides of the ball at a high level. Alek Thomas came to Arizona in the second round of the Draft and raked in Rookie ball with a .333 average while also swiping 12 bases. Add good outfield defense into the mix and Thomas has a strong chance to make some noise at Class A in 2019. After a brief stint in 2017, Matt Tabor came back in 2018 and flourished with Class A Short Season Hillsboro with a 3.26 ERA and a 1.19 WHIP in 60 2/3 innings. With a 60-grade fastball that sits in the low- to mid-90s, Tabor should adjust well to the Midwest League. Fellow Hops teammates Jake McCarthy and Andy Yerzy showed plenty of strong offensive attributes that give Arizona a bit of depth within the organization. Don't sleep on Kristian Robinson either with the 18-year-old outfielder receiving above-average grades on his power, run, arm and fielding tools. Like the system as a whole, there are some things to like about the D-backs' youth here, but not enough to vault the group into the top half. A slew of offseason moves from general manager Jerry Dipoto bolstered a club on the weaker end of the farm system spectrum. In those moves, he netted the Mariners a 2018 first-round pick in Jarred Kelenic from the Mets. The 19-year-old outfielder impressed enough in the Gulf Coast League and earned a promotion to Rookie Advanced, where he put up a solid .781 OPS in 44 contests. He'll face stiffer competition in 2019 with the new organization, but with his advanced approach at the plate, he shouldn't be overmatched. With their own first-round selection in 2018, Seattle snagged right-hander Logan Gilbert out of Stetson University. He didn't pitch professionally after being drafted, but with his hard fastball and breaking pitch mix, he'll be an intriguing arm to watch during his debut. Julio Rodriguez mashed with a .315 average in the Dominican Summer League and will look to continue that strong showing when he comes stateside. A potential pairing on the grass with Kelenic at some point down the line should be mouth-watering to the Mariners' faithful. Signed out of the Dominican Republic, 17-year-old Noelvi Marte will make his professional debut in 2019 after showing impressive work with his legs and bat back home. At times it didn't feel like there was a whole lot to write home about with this system in the recent past, but there is more and more to like in Seattle, at least at the lower levels. Although they shipped a couple of pieces west in the previously mentioned Goldschmidt deal, the Cardinals still have fostered some key young pieces. With the No. 19 pick in last year's Draft, St. Louis selected the powerful Nolan Gorman, who proved early on that his big bat could translate to pro ball. The third baseman blasted 11 long balls early on in the Appalachian League and added six more with Class A Peoria over the final 25 contests. In his first year in the States, Elehuris Montero impressed with a .315 average and an .875 OPS in his best year at the plate since signing with the Cardinals in 2015. Dylan Carlson has gone through up-and-down periods at the plate, but has always displayed patience there and has the potential to break out. In terms of pitching, Junior Fernandez has shifted to a bullpen role, but with a blazing fastball that can reach the upper 90s, there's always a chance he emerges as a key late-inning player. It's definitely a team that has more of its younger prospects leaning on the offensive side, but that doesn't make them any less interesting to watch in 2019. It was an offseason of wheeling and dealing under the new regime of Brodie Van Wagenen and there was plenty of shakeup within the Minor League system for the Mets. Even with those moves, New York was able to keep a bevy of younger players, namely hanging on to shortstop Andres Gimenez. The 20-year-old shortstop has climbed the system steadily, reaching Double-A Binghamton at the end of last year, finishing the season with a .287/.347/.409 line between two levels. Staying at shortstop, young Ronny Mauricio signed in 2017 and made his 2018 debut in the Rookie-level GCL, where he batted .279 from both sides of the plate through his first 49 games. Moving to the hot corner, Mark Vientos came on during the 2018 season and mashed 11 dingers, good for fourth in the Appy League. He still has a ways to go on the defensive side, but there's no doubt he has the tools to be a middle-of-the-order weapon. On the hill, Simeon Woods Richardson came on strong in his 2018 debut by not yielding a run in his first 11 innings in the GCL and will look to build off that and his high-velocity fastball in 2019. Another arm to keep a watchful eye on is Junior Santos, who at 6-foot-8, is hard to miss. He doesn't have the hard heater that Woods Richardson possesses, but does have a good feel for the strike zone. The infielders are the big pieces in this group, however, and it'll be fascinating to watch how they continue their development in 2019. Sixto Sanchez is the big draw here. The No. 27 overall prospect pairs a plus-plus fastball with good off-speed offerings and impressive control, but after missing time with elbow and collarbone concerns, his health remains a slight worry. His ceiling, however, is as good as any pitching prospect in the game. Beyond him, there are other pieces on the younger side who have the potential to cement themselves as bona fide prospects in 2019. One of them is Braxton Garrett, who after four starts in 2017, missed all of 2018 after undergoing Tommy John surgery. Getting ready to recover from the elbow injury, the seventh overall pick in the 2016 Draft will look to regain his plus curveball and use it to his advantage when he returns to the mound this season. Edward Cabrera has dealt with some early command issues (42 walks in 100 1/3 innings in 2018), but there's a lot of potential in his mid-90s fastball that can reach the upper 90s when he's in a groove. Trevor Rogers didn't have the success he and the Marlins probably expected him to have in the South Atlantic League with a 5.82 ERA last year, but the 2017 first-rounder is a prime bounceback candidate. He's a big body at 6-foot-6 with a hard fastball that should produce better results this season. Will Banfield came to the Marlins as a supplemental second-round pick and looked as good as advertised behind the dish, throwing out 41 percent of would-be base stealers in his first season. He has a ways to go with the bat, but he has the chance to provide value on both sides of the ball. Taken one round before Banfield, Connor Scott came to Miami with expectations he could do a bit of everything. He batted .218 in his first stint but should have better numbers in his second go-around. There have been plenty of concerns and inconsistencies here, but it's a deeper group than those below it in the rankings. With a run to last year's Wild Card Game, the A's have positioned themselves well in the American League West and will look even stronger if the prospects from within their system come through. Their starting pitching at the Major League level has been a weak point, but that could receive a huge boost in the form of No. 12 overall prospect Jesus Luzardo, who doesn't turn 22 until September. Limited by an innings limit last year, the left-hander still emerged as an elite prospect with, at times, unhittable stuff from the left side. He blazed all the way to Triple-A and finished the campaign with a 2.88 ERA despite a rough spat at the end of the year. In not the friendliest of hitting environments in the Midwest League, Lazaro Armenteros still put together a .277/.374/.401 slash line with Beloit. A cohort with the Snappers, Austin Beck showed he has enough promise to hit (.296 average) but remained a project elsewhere after going sixth overall in the 2017 Draft. The club's second-round pick last year, Jameson Hannah, was having a fine debut with Class A Short Season Vermont with a .279 average and a .731 OPS before a foot injury ended his season in July. Having him back at full strength this season will be important for Oakland. Some of the names from an offensive perspective might not be the most exciting, but Luzardo carries a lot of weight for his age, given his exciting package and proximity to the Majors. Unlike the A's, the Rangers were not close to reaching the 2018 postseason, but there are a lot of young gems in this system who will make fans in Texas plenty happy in the future. It all starts with the organization's top farmhand in Hans Crouse. Noted for his 70-grade fastball, Crouse has utilized that to his advantage, striking out 92 hitters in 74 2/3 innings since making his professional debut in 2017. Cole Winn also has an imposing primary offering and that should give him enough to make a strong first impression as a 2019 debutante. Anderson Tejeda has been with the organization since 2015, but still is just 20 years old and has all the talent to be a successful everyday player. Even at 5-foot-11, he wields a lot of power, which he showed with 19 homers in the Carolina League. Leody Taveras doesn't have that pop like Tejeda, but still has enough from his hit and speed tools to command attention -- the latter of which makes him a standout outfielder. A two-sport athlete in high school, Bubba Thompson came on strong last year and ended with a .790 OPS. If he can cut down on the strikeouts, he could prove to be an even more valuable asset in 2019. Cole Ragans missed the 2018 season with a UCL tear, but if he's anywhere near where he was before the injury, the lefty should be back to racking up punchouts. It could be a tough year for the big club, but with an eclectic mix of stars, the Rangers have a fun, young group to look out for this season. With some of the older players moving to the big leagues, Cleveland boasts a lot of 21-and-under talent, especially at the top of the organizational ladder. Even with his lanky frame, No. 41 overall prospect Triston McKenzie has continually found success as a starter, hitting Double-A last year and ending with a 2.68 ERA in 16 starts. Forearm issues kept him from pitching a full season, so it'll be intriguing to see how he does over the course of a lengthy campaign this year. Right behind him as the second-ranked prospect in the group is the powerful Nolan Jones. Between the Midwest and Carolina Leagues, Jones cranked 19 homers while posting an .871 OPS. He has enough power to stick at third base and consistently plug himself in the middle of the lineup. Even without as much pop as Jones, Tyler Freeman has proven to be a force at the plate, as he hit .352 last season to lead the New York-Penn League. While they lost Francisco Mejia in last year's trade with the Padres, the Indians still have a catcher in the system with offensive upside in first-round pick Bo Naylor. He amassed a .274 average in the Rookie-level Arizona League and should continue to be a force with the bat as he moves up. George Valera had a short stint in Arizona with Naylor last year, and in that small stateside sampling, it was evident his approach allows him to draw walks and make solid contact -- positive assets from the lefty batter's box. With Ethan Hankins and his plus-plus fastball likely to see more action this season, the Indians prove to be a well-rounded group of young talent. The Tigers sport a collection of impressive arms who could make any organization salivate. With a three-pitch mix that can baffle the best of hitters, Casey Mize went first overall in the Draft out of Auburn and made his way to the Florida State League by the end of the summer. It might have been just 13 2/3 innings, but Mize's tantalizing stuff (like his plus-plus splitter) was on display in his brief stint, making it hard not to get giddy about his first full season. Right next to him is right-hander Matt Manning, who started to cut down on the walks and use his fastball-curveball combination to dominate games, ending the year with 154 strikeouts in 117 2/3 innings and a ticket to Double-A Erie. Pitching at three different levels, Manning posted a 3.29 ERA and held hitters to a .211 average. Now in the upper levels of the Minors, Manning can really establish himself as one of game's better power pitchers. Acquired by the Tigers in the Justin Verlander deal, Franklin Perez had the chance to make a statement with his new organization in 2018, but a lat strain limited his time on the mound to 19 1/3 frames. With better health, he's a top candidate to step up this year. Taken 43 picks after Mize, Parker Meadows adds a speedy component to the Tigers outfield that makes him versatile enough to play anywhere in the field. Isaac Paredes and Willi Castro both man the shortstop position and can provide enough solid contact to be plenty useful to the club at some spot on the dirt. When it boils down to it, the young pitching is the bread and butter for the Tigers, and 2019 should show more of the same. Dipping into the top 10, the Reds boast some high-ceiling youngsters. Flame-thrower Hunter Greene battled inconsistency with Class A Dayton, but armed with a 100-mph fastball and at just 19 years of age, he is a tantalizing figure on the mound. Second-ranked Taylor Trammell enjoyed a solid year in the Florida State League while 21-year-old right-hander Tony Santillan averaged nearly a strikeout per inning and posted a 3.08 ERA across two levels. Other interesting names include Cincinnati's fourth-round pick last year, Mike Siani (19), left-hander Jacob Heatherly (20) and outfielder Mariel Bautista (20), who batted .330/.386/.541 with 24 extra-base hits, 37 RBIs and 16 stolen bases with Rookie Advanced Billings in the Pioneer League. Trammell and Greene are the two big headliners, but there's more to like here than just that pair. The Angels' resurgence in the Minors continues into 2019. The emergence of 2017 first-round Draft pick Jo Adell came quickly. The 19-year-old finished the year with Double-A Mobile and combined to hit .290/.355/.543 with 20 homers and 77 RBIs in 99 games. While the number of potential impact players 21 year or under may not match top-ranked San Diego, Los Angeles does boast 17 players in its ranked top 30 who will begin the year younger than 22 years old. Brandon Marsh, Jahmai Jones and an eye-opening season from southpaw Jose Suarez -- all 21 years old -- has elevated the system after several lean years, and the addition of Jordyn Adams with the 17th overall pick last year only gives it even higher standing here. Although Adell currently stands as the club's only Top-100 prospect, the Halos are flush with an abundance of young talent worth following in the months to come. Los Angeles has won six consecutive division titles and represented the National League in the past two World Series. Their success doesn't figure to end soon with a host of prospects on the horizon. Led by 20-year-old catcher Keibert Ruiz who slugged 12 homers at Double-A Tulsa last year, five of the Dodgers' top 12 prospects from the 2018 rankings are under the age of 22. That list includes right-hander Dustin May (21), Gavin Lux (21) and 20-year-old Jeter Downs, who was obtained from the Reds in December. Twenty-year-old Gerardo Carrillo posted a 1.50 ERA in his domestic debut while Omar Estevez (20) compiled 60 extra-base hits and 84 RBIs with Class A Advanced Rancho Cucamonga. Ruiz, May and Lux should open at Double-A or above, and having that trio achieve success this quickly pushes the Dodgers up the list. If it seems as though the Astros continuously find themselves among the best Minor League systems, it's because they are. Though they drop three spots from last year, the organization finds itself in good shape for the foreseeable future thanks to 11 players 21 or under in their top 30 from 2018. Forrest Whitley leads the way, although he started only eight games in 2018 due to a 50-game suspension and a pair of injuries. The 21-year-old still fanned 34 in 26 1/3 innings, giving him 203 whiffs in his first 137 1/3 frames as a professional. Outfielder Yordan Alvarez homered 20 times across two levels last year while 19-year-old Bryan Abreu was nearly unhittable between Class A Short Season Tri-City and Class A Quad Cities. The addition of shortstop Luis Santana in an offseason trade with the Mets gives Houston a highly regarded player who batted .348/.446/.471 as a 19-year-old in the Appalachian League. It's an eclectic group of youngsters, led by the top pitching prospect in the game in Whitley. The Nationals aren't strong in everything in terms of their farm system, but they are strong in youth. Even with Juan Soto graduating to the big leagues last year, Washington boasts two of the Minors' top-rated prospects in 21-year-olds Victor Robles and Carter Kieboom. The duo ranks fourth and 25th respectively among the game's Top 100. A pair of teenagers sit three and four in the Nats' prospect rankings, including 18-year-old Luis Garcia, who batted .298/.336/.406 in 127 games across two levels in 2018. Although he did not throw a pitch after being drafted in June, Mason Denaburg was touted as one of the nation's best high-school hurlers before he was taken 27th overall last year because of a fastball that tops out around 97 mph. Right-hander Tim Cate (21), infielder Yasel Antuna (19), catcher Israel Pineda (18) and outfielder Gage Canning (21) give Washington eight prospects 21 or under in their top 10. Like the Blue Jays, the Twins are heavier on top-end talent than in overall depth in players under 21 years old, but two of their prospects stand among the best in the game. Top-ranked Royce Lewis (19) and No. 2 Alex Kirilloff (21) formed arguably the best 1-2 punch in the Minors between their stops at Class A Cedar Rapids and Class A Advanced Fort Myers. The duo combined for 119 extra-base hits, 175 RBIs and 158 runs scored while batting .321 and leading the way to a Florida State League title. Brusdar Graterol (20) took a giant step forward on the mound while Blayne Enlow (21) was a consistent force with Cedar Rapids. Another arm to keep an eye on is Jordan Balazovic (20), who averaged 11.4 strikeouts per nine innings in 2018. Even that aside, Lewis and Kirilloff would be enough to get Minnesota close to the top five in this category. The Blue Jays enter 2019 with much of their young talent resting on the shoulders of teenagers Vladimir Guerrero Jr. and Bo Bichette. Despite missing six weeks with a knee injury, baseball's No.1 overall prospect (also known as the son of Hall of Famer Vladimir Guerrero) flirted with a .400 average. The 19-year-old ended up producing a .381/.437/.636 line while smashing 20 homers and plating 78 runs in 95 games with Double-A New Hampshire and Triple-A Buffalo as well as four rehab games in the Gulf Coast and Florida State Leagues. Bichette, who turns 21 on March 5, compiled 61 extra-base hits, 95 runs and 74 RBIs while batting .286/.343/.453 in 131 games with New Hampshire. Although their overall depth pales in comparison to the teams above them, Jordan Groshans (19), Eric Pardinho (18) and Adam Kloffenstein (18) all boast enticing talent as teenagers. Those are the pop-up names, but Guerrero takes up the whole marquee on his own. Graduating several of their top prospects to the Majors led to an inevitable drop for the Braves, who slipped from No. 1 last year to third heading in 2019. Even so, the reigning National League East champions are flush with young high-end talent, particularly in the pitching department. Although a shoulder issue limited No. 1 prospect Mike Soroka to 11 starts between the Majors and Minors last year, he was lights-out with Triple-A Gwinnett and solid in the bigs. The 21-year-old has plenty of company on the mound with hurlers Ian Anderson (20), Bryse Wilson (21), Kolby Allard (21) and Joey Wentz (21) well on the path to the bigs. Though Atlanta's position players don't quite match up their pitching, center fielders Cristian Pache and Drew Waters -- who will play all of 2019 at 20 years old -- hit .279 and .293 respectively as two of the younger players in their leagues, and both Top-100 prospects contribute plus defense on the grass. It's still a very promising ceiling for the Braves, even after Ronald Acuña Jr. graduated. Breakout performances from a host of young players vaulted the Rays into the second spot after finishing 18th in the same category last year. The charge begins with teenage sensation, top prospect and Appalachian League Player of the Year Wander Franco -- who won't turn 18 until March 1 -- after he batted .351/.418/.587 with 28 extra-base hits and 57 RBIs in 61 games for Rookie Advanced Princeton. Jesus Sanchez (21) took another step forward in 2018 while catcher Ronaldo Hernandez (21) smacked 21 homers with Class A Bowling Green. In the middle of the infield, second baseman Vidal Brujan and shortstop Lucius Fox would stand out in most other organizations with their toolsy profiles, but can get lost in Franco's shadow. On the mound, first-rounders Matthew Liberatore, Shane Baz and Shane McClanahan all fit the bill for this group, and southpaw Resly Linares (21) impressed at Princeton, fanning 97 in 84 1/3 frames. Much like the Padres, the Rays are heavy on young talent, with 16 of their top-30 prospects from last year entering Opening Day at 21 or under. 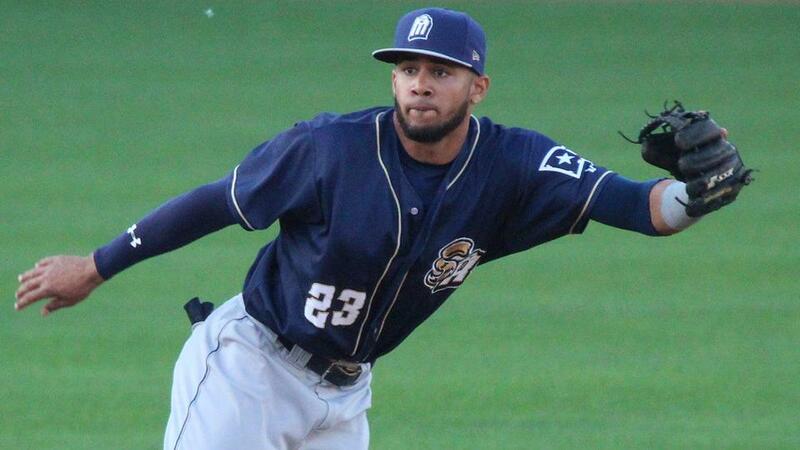 San Diego has built one of the game's strongest systems with shrewd drafting, international signings and trades -- perhaps none bigger than the deal for second-ranked overall prospect Fernando Tatis Jr. Despite having his season end after 88 games with a fractured left thumb, the 20-year-old batted .286/.355/.507 with 42 extra-base hits, 77 runs scored and 16 stolen bases with Double-A San Antonio. But Tatis is just the tip of the iceberg for the Friars. Second-ranked MacKenzie Gore (20), No. 4 Luis Urias (21) and No. 6 Adrian Morejon (19) are three of 19 Padres among the club's top-30 prospects from last year who will begin the season 21 years old or younger. All told, a whopping seven Padres under the age of 21 make the overall Top-100 list including those four, Logan Allen, Luis Patino and Ryan Weathers. Outside the Top 100, Josh Naylor, Anderson Espinoza, Hudson Potts and Xavier Edwards are young players who could find themselves playing big roles in San Diego's plans for contention. There just isn't a more talented or deeper group of players aged 21 or younger in the Minors heading into the 2019 season. Tyler Maun, Andrew Battifarano and Michael Avallone are contributors to MiLB.com. This story was not subject to the approval of the National Association of Professional Baseball Leagues or its clubs.